Friends! After buying the indicator, send us an e-mail to sendkod@ukr.net! We will give you a trading instruction + 2 indicator for free! 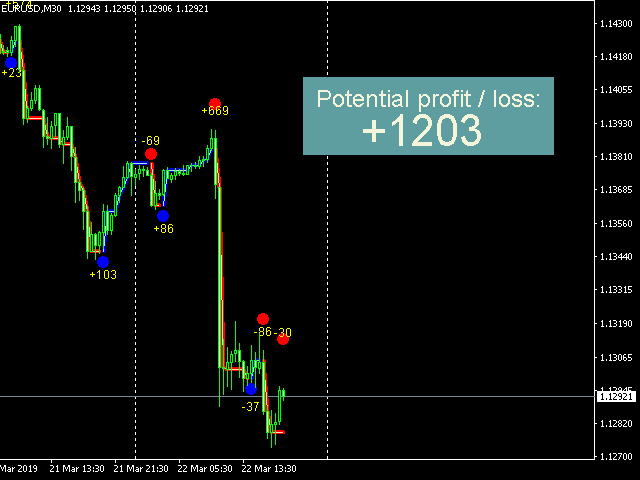 Scalping monster - ready trading system in the form of an indicator. 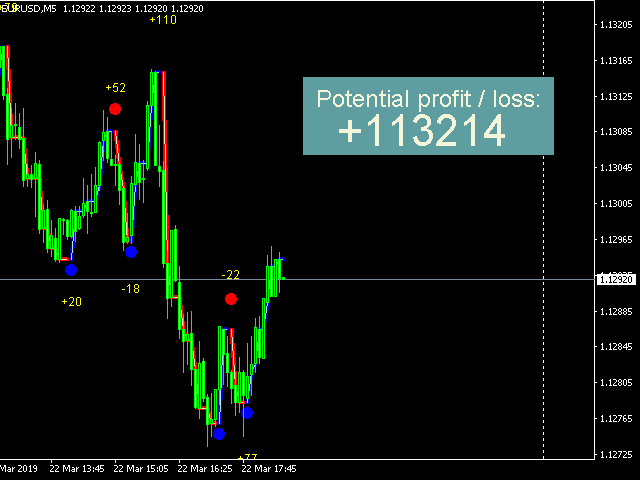 Scalping monster is designed for the Metatrader4 platform. 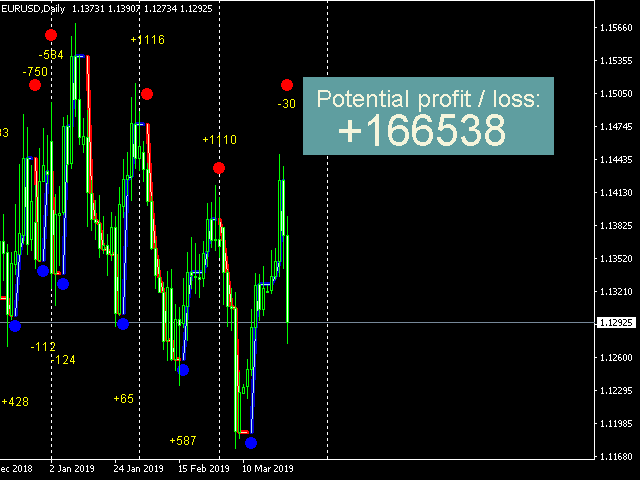 When placed on a forex chart, the indicator automatically analyzes the market using an adaptation algorithm and displays the signals to the trader in the form of red and blue dots. The indicator also shows in the upper right corner information about potential profit / loss. when the blue dot appears on the chart, we open a buy order. Close the order when a red dot appears. when a red dot appears on the chart, we open a sell order. Close the order when the blue dot appears. Do not open an order before the release of important news. open order immediately after the point appears. It is not necessary to open an order in the middle of the cycle. It works on all currency pairs. shows the trader points to open and close orders. is a complete trading system. sends push and email notifications. Open the indicator settings and find the "spread" parameter. Indicate there the value of the current spread for this currency pair where you want to test it. 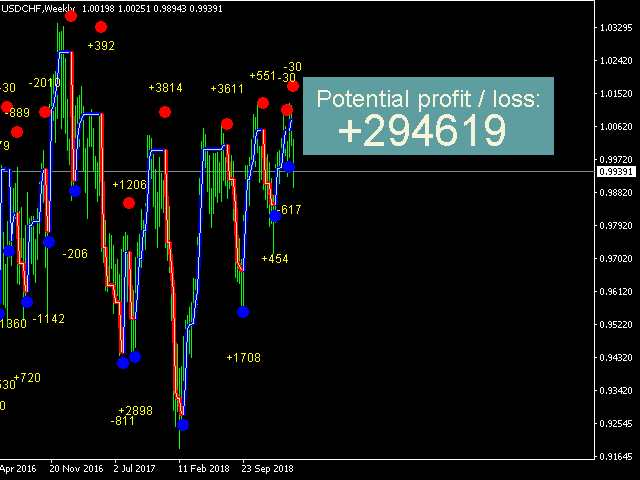 Next, add the indicator to the chart of the currency pair and look at the forecast profit / loss in the upper right corner. If the indicator predicts more than 1000 points of profit, you can start trading. Thus, by placing the indicator on charts of different currency pairs and timeframes, look for those where the indicator will forecast profits. spread - your broker's spread for the current currency pair. averaging_period - averaged indicator period. shift - shift of the starting point of the calculation, relative to the price. bars - the number of bars at which the indicator will work. thickness_of_thick_line - thickness of the thick line of the indicator. thin_line_thickness - thin line thickness of the indicator. Signal - sending push and email notification of signals. inform - enable / disable display of information on the screen. The forecast profit / loss which is displayed is totally not accurate, signals dont repaint however they appear during candle formation and the Indicator displays profit from candle opening, and Alerts are not working at all. The author responded fast and fixed the issue and explained how the Indicator works and provided a strategy to use it, can confirm it doesn't repaint like most indicators and alerts are working. 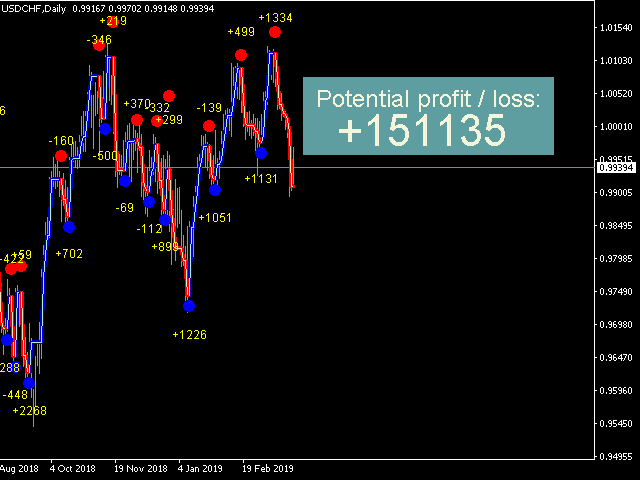 We were contacted by the user Axel Lindenmann on 12/04/2019 with the remark that the indicator does not correctly calculate profit / loss. Check confirmed this information. Programmers quickly fixed this error. In version 8, we fixed an error in the calculation of profit / loss which is displayed in the right corner of the chart. Fixed accounting of the spread when calculating the profit. 2. Changed the algorithm for calculating profits. Now the compensation function works. Profit is calculated from the closing of the initial bar to the opening of the final one. Improved algorithm for finding pivot points. Fixed counting and adaptation algorithm.